the user cancelled the "Write Basic Prog" interaction. the flashing screen borders, the dreadful "R: Tape Loading Error"! EDIT: No need to write my my article: anyone interested in custom sounds can refer to this nice Tutorial by Hexameter, posted some days ago. CUSTOM DETAILED MESSAGES - Most of the actions, events and interactions involving the ZX Spectrum are accompained by funny explanatory messages: read them all and enjoy! This is a Sinclair ZX Spectrum 48K, with a connected Interface-1, a ZX Microdrive, a TS2020 Tape Recorder (with the original "Horizons" tape inside!) and a Kempston Joystick; for the best "flashback" experience, the ZX comes with a TV-set in pure vintage style: the Synudyne Fauno. All the mentioned parts are included in a single object, you just have to by the whole set from the catalog (section Electronics -> TV and Computers). The initial price is 550§; but this is an historical computer: the longer you'll keep it, the higher will raise its value. Playing games on the ZX - Click on the ZX and choose "Load & Run"; you have 9 different classic games to choose from. You'll hear the characteristic tape loading sound (there are few chances that you get a Tape Loading Error, too! : ) and will see the typical loading colours on the screen; and then the game will start. Other sims can watch the player, and improve their (and your!) Fun and Social motives. Creating BASIC programs - While playing grants only fun, writing BASIC programs gives fun, logic and creativity; and when finished, you can "Sell BASIC Program", and earn simoleons! The price you can get from your programs depends on the skills you have built: the maximum amount (1680§) can be obtained with 10 points of Logic, 10 Creativity, 2 Mechanical and 3 Charisma (this last one is useful when dealing to customers...). Please note that you have to build Mechanical and Charisma with other objects: the ZX Spectrum doesn't help building these skills. When you sell a program, read the letter you recieve along with the money: there's a special surprise that appears only once (once per ZX)! If a non-playable sim creates a program using *your* ZX Spectrum (i.e. the creator is a customer of your business lot, or is a visitor of your house, or is a student in your University lot), he will sell his program automatically, and give you 20% of the earnings! When a sim starts creating a program on the ZX, the program is stored on the ZX Microdrive, and no one else can use it to create programs, until the program is finished and sold. The programmer can't start another program on another ZX (on the same lot): in this case, you will have the option "Continue Basic Program" (instead of "Write Basic Program") only on one ZX. Note: when a sim writes a BASIC program, a progress bar will appear over his head; that bar will tell the % of completion of the program, NOT the learning skill level. Community/Business/University Lots - The ZX can be used in any lot, and anyone using it to create BASIC programs will improve his Logic and Creativity (including customers and visitors). You can sell the ZX in shops, if you like. As said, NPC sims that sell program created using your ZX will give you a 20% fee. In OFB lots, formatting the Microdrives is considered a normal maintainance operation: customers won't like it, of course, but the relationship between the owner and the customer won't suffer. The ZX Spectrum is compatible with any game, from the bare base-game to H&M Fashion (and possibly future expansions). The ZX Spectrum, and all its parts are recolourable; but I made it recolourable mainly to let you recolour the TV-set: if you dare recolour the Spectrum itself, I'll come and catch you!!! 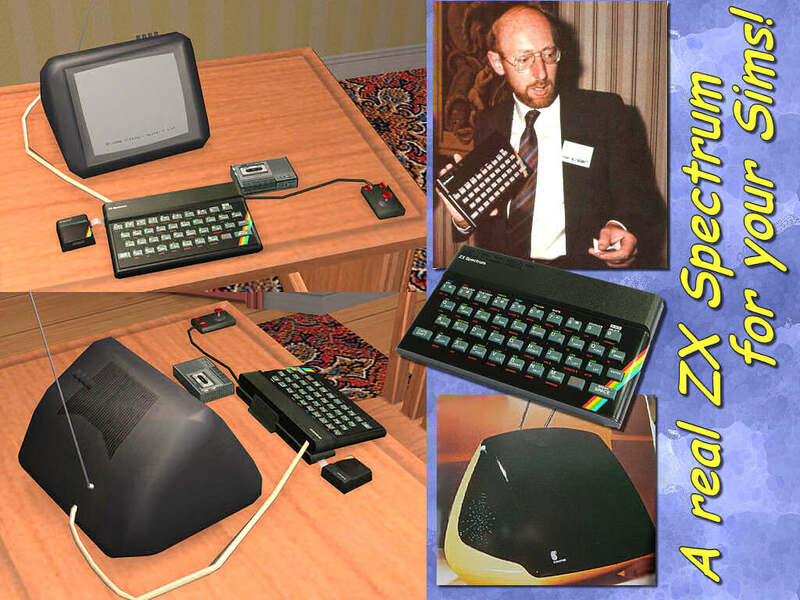 Many hearty thanks to Sir Clive Sinclair: an entire generation of computer enthusiasts owes him a lot! "ZX Spectrum" is a trademark of Sinclair Research Ltd. Thanks to MJ Hibbett and the Validators and their lovely "Hey Hey 16K": I've listened to this song countless times while creating my ZX Spectrum! Last but not least, many thanks to MaryLou, my favourite beta-tester! How many errors she discovered in the ZX during its creations! DO NOT CLONE - DO NOT REPOST ANYWHERE, especially the Exchange! - See my profile for full-detail policy. Back in the day I had a Sinclair (I wanted the Commodore). What a relic even back then.